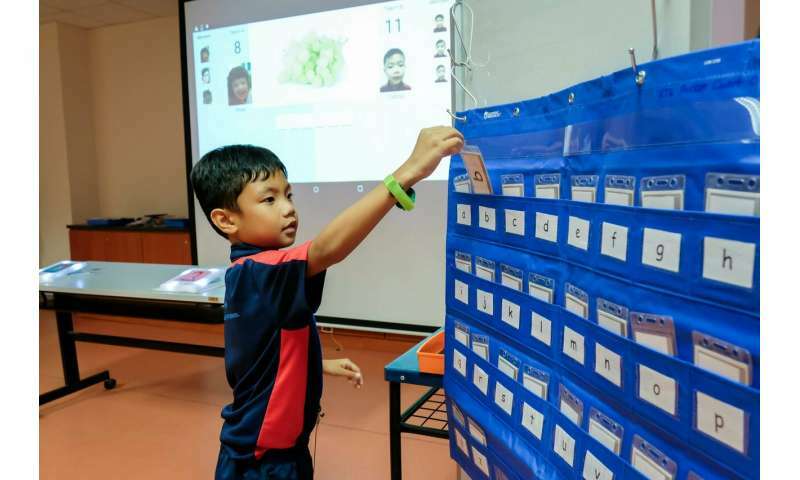 Working with teachers from the Movement for the Intellectually Disabled of Singapore (MINDS) Fernvale Gardens School, NTU researchers developed lessons based on the i-Tile technology. Since 2018, the i-Tile learning activities were trialled at the MINDS Fernvale Gardens School – a school for children and youth with moderate to severe intellectual disability and Autism Spectrum Disorder (ASD). Research findings from the trials suggest that the design of the i-Tile learning activities, which incorporate purposeful movement, game-like elements and responsive audio-visual feedback, are effective in increasing and sustaining student engagement. The i-Tile lessons were also observed to help students learn values such as the need to take turns and teamwork. The reconfigurable nature of the i-Tile system also allows teachers to adapt and design new learning activities to meet their students' diverse learning needs. Teachers are keen on using the i-Tiles to help students remember their personal information, such as their telephone numbers and their home address, or to teach students money skills and how to shop for items in a supermarket. "We set out to develop appropriate low-cost technology, which the teachers can readily incorporate movement, play and collaboration into their lessons, so that it engages the students in their learning," said Assoc Prof Goh, Associate Chair (Faculty) of the School of Computer Science and Engineering. Ms Koh Gee May, deputy CEO of MINDS said, "The students who are involved in the project have gained huge strides not only in academic areas but also in other areas such as the ability to display great sportsmanship, and communication and interpersonal skills. Students have become more confident in reading and spelling as the programme provides immediate feedback once they complete the tasks. "As the programme involves interactive, collaborative and competitive play, it encourages our students to engage with one another in its play, thus enabling the students to work together and at the same time, show respect and generosity to their fellow competitors. The beauty of it all is that the technology used is easy to learn and versatile so teachers can customise it to suit students' varying learning needs and achieve individual goals." Moving forward, Prof Goh will be working with the teachers from MINDS Fernvale Gardens School to scale up the lessons to other classes, training more teachers in the use of the teaching tool and customising learning resources to meet future learning needs. If successful, the i-Tile learning system and pedagogy could be rolled out to the other MINDS schools and will also be available for licensing from NTU. The i-Tile system consists of two tablet computers and a custom-designed card-reader (the i-Tile) that can detect objects with Radio-Frequency Identification (RFID) such as a picture or alphabet card. The teacher facilitates the lesson using one tablet computer, whilst the other tablet computer acts as a coordinated remote display and is connected to the classroom's projection display. For instance, an image of an apple would appear on the screen and the student will have to move up to the front to select the corresponding word card and tap it against the i-Tile, which would then respond with the appropriate light and sound, indicating whether the choice is correct. Compared to regular lessons, teachers involved in the trial unanimously agreed that the i-Tile lessons generated more motivation for their students. Some students look forward expectantly to the next lesson, wanting to excel and get the right answers. This positive attitude in learning gave the students a sense of pride in their achievement and sustained their engagement. One teacher said her students have made efforts to practise their spelling lessons at home to improve their sight words which are frequently used words that young children are encouraged to memorise for ease of recognition. In particular, two students had made a marked improvement in their learning thanks to the i-Tile lessons, with one receiving a Good Progress award and the other a Merit award from the school at its year-end award ceremony.